Today I want to talk about a recent employment success story with a person with Asperger’s. I was recently assigned to conduct an environmental work assessment with this young man. He listed his issues as Asperger’s, obesity, back aches, leg aches and insomnia. There have been a few challenges in this man’s life. During the initial interview his parent stated, “He can’t do anything but eat and sleep.” She had no confidence that he could ever hold a job. This gentleman is not a kid, he is a little older, which goes to show that the confidence we have in our kids trickles down throughout life. This gentleman really doesn’t think he can work and was not very enthusiastic about our meeting. I had him take a self-evaluation which he was able to complete on his own and showed that he did not have a lot of confidence in his abilities. He said that he would really like to do data entry at a large IT company but showed that he could not type very well. Many of our high functioning kids with autism want to do some sort of IT/Gaming work but do not really know what it entails. This is where realistic level setting come into play about expectations and education. I took this gentleman to three different work environments to observe social skills, problem solving, communication challenges, physical challenges and more. He loved interacting with the cats. I first observed him in a retail setting. He had been let go from a large retailer a number of years ago and was not enthusiastic about this setting. He talked about how much he disliked the management and how he was not treated well. This environment did not go well. He was not energetic or motivated. There was a lot of “poor me” going on. The second site that we visited was a local library. Libraries tend to be good sites for our kids as there is a low stress level, lower lighting and little noise. My client again did a couple of self assessments and typing tests. He worked with the library assistant to observe and assist with duties. Again, he was not very enthusiastic, barely spoke and showed no facial expression. To be honest he seemed like he just didn’t want to be there, be with me or work in any capacity. As with any potential job candidate you spot, motivation, desire and the ability to perform. I wasn’t seeing it and wondering what might motivate him if anything. I was wondering if he had been told for so long that he couldn’t do anything that he truly believed it. For the third site, I decided to try something different. He had stated that he liked animals so I arranged for him to work for a day at a “no kill” shelter. 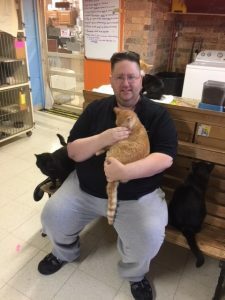 Upon arriving he shook hands with staff and met each cat in the cattery. He took directives from a very shy kennel technician that he became very comfortable with. He loved interacting with the cats. He was able to hold and comfort them. He was able to show cats to potential cat owners and showed a knowledge for the different breeds. He was shown how to enter detailed information about new cats into their system and was able to do so on his own. He was very comfortable and animated. He stated that cats understand him. Cats were climbing all over him and he was very comfortable. The facility was fairly bright and the smells weren’t always pleasant but he was so happy that this didn’t seem to bother him. In the short time that I’ve known him he has never expressed positivity. But in this setting, he smiled, he engaged in a professional capacity and each staff stated that he was excellent in each duty he performed. These duties included laundry, general cleaning and cleaning out kennels. He even asked several times if there was anything else he could do. Unlike the other two environments he thrived here. The multiple work assessments allowed us the opportunity to see for ourselves what our client was passionate about. This environment was not stressful and not overly demanding, but more so than the library. Yet he felt a sense of worth here that he did not feel in the other environments. This was not the environment that I thought he would thrive in but the multiple environment work assessments allow us to try different things and we all learned from the experience. We are currently pursuing possible part-time worksites in this type of environment. He is very excited and I’m sure that we will be successful. To you parents, take your kids out of their comfort zone and expose them to different experiences in the outside world, you may be surprised! Kids can be a struggle; all kids can be a struggle but they pick up on your positivity and your negativity. Kids will eventually believe what you tell them they are and are not capable of. I know that you are all positive parents. So, my advice is to stay the course, stay strong and when you feel you can’t, reach out to your supports. As parents, we need support too.